White-tailed deer investigating and photo bombing the camera trap. 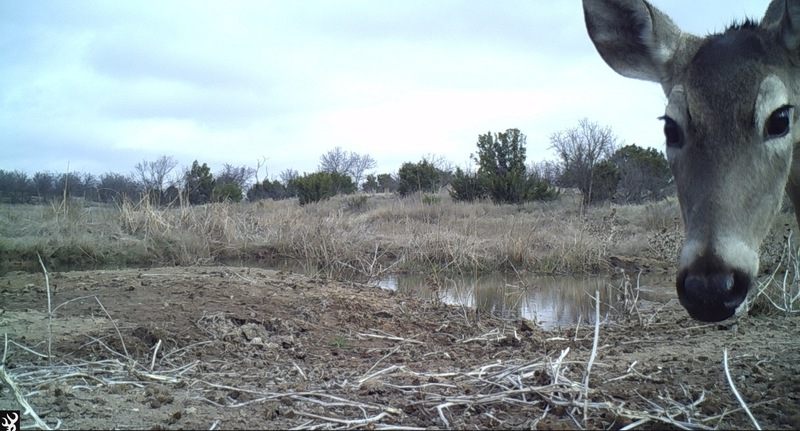 Earlier this year I began a camera trap survey at Comanche Springs Astronomy Campus (CSAC) west of Crowell, Texas. The survey’s purpose is to acquire base-line data on what faunal life is present and utilizing the 700-acre campus. Wildlife surveying is important for a many reasons and for this project I’m concentrating on four main objectives at CSAC: acquire a baseline on animal populations; identify animal types; help with management of species, especially invasives, i.e., feral hogs; and identify if endangered animals are present in the area. The most economical means to do this survey is through the employment of camera traps. Overall, the data will help CSAC with management and conservation of the property. Through this baseline survey on species and abundance they can better manage their property for conservation of certain species or enhance habitats for other known species in Foard County. Some of the first photos I captured after I set four cameras out in March included a white-tailed deer photo bomb, a raccoon and a bobcat. Bobcat trigging the camera trap. As part of my research I’m also documenting the flora and fauna species, because the latter cannot be all captured via the camera traps.